A beautiful holiday house, situated on the waterside on a small park with 28 houses. 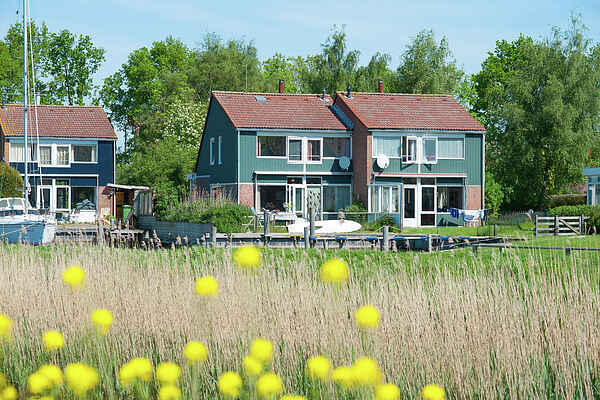 With broad views, splendid lakes, green meadows and historic towns and town centres is the Southwest corner of Fryslân where Warns is situated, a unique area. From Warns (situated along the Elfsteden route) you can make wonderful cycling trips to e.g. Gaasterland, Workum, Hindeloopen or Stavoren. From here you can even make day trips with the ferryboat to Enkhuizen or travel by train to Sneek and Leeuwarden. Along the Ijsselmeer (2,5km) there are many beaches where you can swim, surf and fish.